Empty at last. My home of the last five years was now a house again, empty of my family’s presence, pictures, and remnants. It had been a long, lonely ordeal of packing, sorting and disposing of my household goods. I had been alone for two months as my husband had begun a job eleven hours away. Did I cry these tears in vain? Or will You just leave me here? I had spent the last two months, seeking hard, studying diligently seeking to deeply satisfy my empty loneliness with the taste of God. I knew that this was a note from my Father, it had His flavor all over it! It was the provision I needed before I began the eleven-hour drive to another state. The next morning, my car was loaded with treasured belongings and essentials, including two large dogs; my sleeping companions for the journey. As I was leaving the city limits, I HAVE THIS HOPE, played on the radio. I almost had to pull over because I was so overwhelmed with joy. Tears began to flow, as I tasted the goodness of God who had been and will always be my refuge. The tongue, the taste organ of the body, has 10,000 taste receptor cells. These cells convey information about the chemical composition of the “soluble stimulus” that come in contact with the tongue. This process is responsible for the pleasure derived in consuming delicious food. The soul, the essence of our being, is equipped to receive unlimited stimuli from the presence of our omniscient, sovereign God. 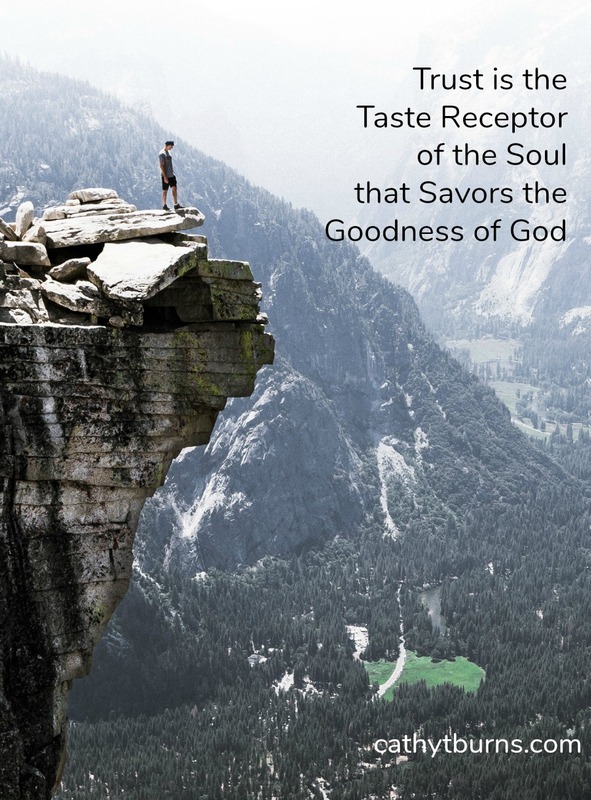 Our trust determines the soul’s limitation to accurately taste the goodness of God. In that moment of hearing the song on the radio, my heart perceived his constant provision and presence. I was confident I was going to make the journey, accompanied by His presence. What a joy! The more we examine Who God is and open the eyes to our heart we will be able to perceive His provision and presence. Examine and see how good the Lord is. We trust as we surrender and let God break and soften our hearts, knowing that He is good and His love is great. I hope things are going well for you, I hope you know there are many people out there who also love you and are praying for you in whatever it is that comes your way. You were so great for Edy and I at the hideaway and we will forever be indebted to you and love you for what you did for us. Keep the strength and know how awesome you were for us. Godspeed and his blessings on you and your family always!!! !